This dish came along, like many others through experimentation and the process of experimentation doesn’t have to stop here. Fresh parsley can be substituted for the cilantro, if you want a less defined taste. Some folks prefer fresh lemon juice in place of the vinegar. Again, let your palate be your guide. Traditionally, we serve fish steaks with root plants (bianda) or boiled green bananas (guineos). Wash steaks under cold running water and pat dry with paper towels. In a mortar, crush peppercorn and garlic. In a small bowl, combine peppercorns and garlicwith tomatoes, cilantro, vinegar and olive oil. Arrange fish steaks in a baking dish large enough to hold the fish comfortably. Spoon tomato-cilantro mixture over fish. Bake 10 minutes or until fish flakes easily when testing with fork. 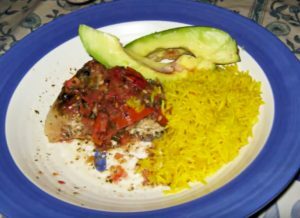 Oswald Rivera’s Blog http://oswaldatlarge.blogspot.com/ is a wonderful place to get new food ideas and recipes.